Includes Custom Pneumatic opener attached to wall mounted track, *Liftmaster MyQ wireless control, 100 feet of air tubing, control box, and fittings. 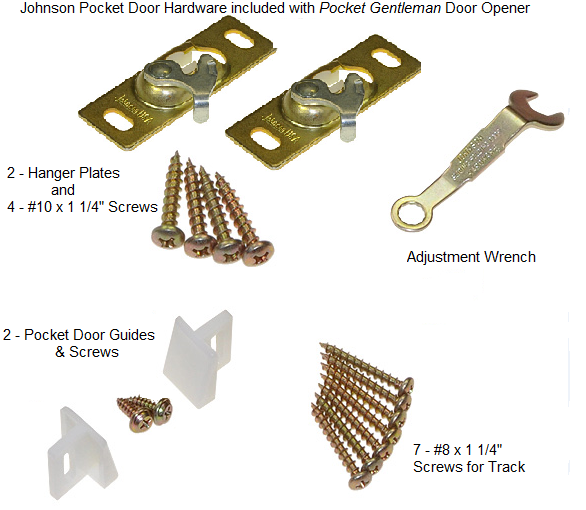 Johnson Hardware includes HD ball bearing hangers rated for a 200 lb. door! Please call with special requests for your installation or questions. Air compressor not included, please order separately if needed. Quick solution for bathroom wheelchair accessibility! The Wall Mounted Gentleman Sliding Door opener is designed to make quick work of converting a swinging door to a sliding door. As opposed to a pocket door, which involves opening up a wall and possibly having to move electrical, plumbing, or HVAC systems to install the door. The new construction/renovation kit is mounted on the wall adjacent to the opening. The control system powers the door and is able to sense an obstacle and relax pressure automatically when closing, making for safe operation. The area where the door opens must be kept clear or protected from obstacles. The door functions as normal when used manually, but you won't want to move it manually ever again! The pneumatic tubing and the remote system are all plug and play. There is no need to hire an electrician, but you may need a handyman to install the Wall Mounted Gentleman. You simple remove a portion of the casing from the door and mount the track, very easy. You receive a wireless remote system or you may adapt to your existing system. It only takes a simple switch to interface with the Wall Mounted Gentleman! You will need a source of compressed air to operate the Wall Mounted Gentleman. Although quiet models are desired, many customers locate the air compressor in a garage or basement up to 125 feet away. If you already have a source of compressed air, you may use it to power the opener. Additional tubing and connectors are available, please call. An automatic Wall Mounted Gentleman Sliding Door opener is a fast and easy way to change a swing door to a slider and get more maneuvering room for wheelchairs, walkers, and scooters!